Riding for Ireland. Mrs Cassini will be pleased. Does she stretch out to a length too? As a civilised gentleman, I have no idea to what James may be referring and will move on. ...is a wonderful coach,why he is not at Palace is something I don't understand, he is not money driven whatsoever. Given where Silva ended up, I don't think money was the issue, although I'd question whether money really is a non-issue for him, or indeed most people. Possibly an interesting trend that began in 2015 and continued in 2016, but unfortunately the comment doesn't reference the league or leagues producing those returns. I'd be extremely wary of any system built around a single calendar month, even if it has been profitable for two seasons. Quick comment to make on always excellent Green All Over blog and in particular one of the stats that was on that post. One way to mitigate the dynamic lines issue is to set yourself strict rules. For instance to determine if a MLB team is an underdog, the team needs to be priced at least at 2.000 (+100) at Pinnacle even if you don't play at that bookmaker. I choose Pinnacle because it's the sharpest book on the market which make it a good reference for odds. BTW do you take the bookmaker margin when calculating the Implied Probabilities? As readers will know, Pinnacle are my go-to book, as they are the most efficient in the business (as the comment says), and with their business model, no serious punter is unable to place bets with them. However, even if you always use the same sportsbook for your selections, that still doesn't solve the problem of the lines changing. For example, a team can be a qualifier at the time of the game, whereas it wasn't six hours earlier, but was 12 hours earlier, or late money can move a team so that it is no longer a qualifier although for days it looked like it would be. The result, as I said before, is that in the real world, when for most of us with lives, it simply is not possible to wait until game time, you are sometimes on teams that are non-qualifiers, and not on teams that are. Sometimes these line moves will work out for you, sometimes they won't. It's nothing to get too worked up about over the course of a season, and similarly, with the over-rounds these days as low as they are, I don't worry about the bookmakers' margins. Being consistent, i.e. having strict rules, is more important. As mentioned previously, I am travelling for the next couple of weeks, the first on business starting today, while the second is for a much deserved holiday, carefully timed to conclude in time for my spreadsheet's month-end updates! Last October, I mentioned one of the problems with playing a system based on Implied Probabilities. With lines being dynamic, qualifiers for a system like this will always be subject to change, and the list will vary depending on where you take your line from, and when you take it. As Doc Sportello found yesterday, qualifiers can come and go. The Kansas City Royals were a qualifier for the T-Bone System with a price shorter than -140 (1.71) at whatever site he was using, yet by the time of first pitch were, according to the web site I use, -135 (1.74). Incidentally, they are currently qualifiers again today, at -145 (1.69). Teams that ended up in the -125 (1.8) to -140 range this season are currently in profit, by a massive 0.19 points, but how many of those shortened into that range, and how many drifted into it, I have no idea. 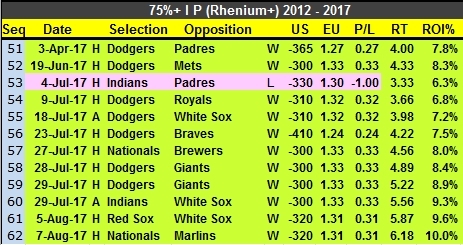 Last night also saw a rare loss for the Rhenium System (IP 0.75+) with the San Diego Padres (again) failing to follow the script. I will not be mentioning football for a while. Unlucky there on your debut Cassini. Still, you got third so there is plenty to build upon. Perhaps if I'd had a little more warning, I might have prepared myself better. Slowly away, in touch in last trio, ridden over 2f out, progress to chase winner over 1f out, no impression after, lost 2nd near finish, kept on (tchd 5/1). Better luck next time Mr C! Yes I do know. I was there! The race summary was reminiscent of my Friday nights out as a young man. Chasing, making no impression, and losing out near the finish. Regarding your posts concerning the "backing all homes idea" I wonder if you had the stats to hand showing what would happen if you excluded the first and last 6 sets of fixtures? Stewboss takes this approach with the view that form needs to settle down at first, with games at the tail-end sometimes meaningless. I've tried looking at the data via the sites you suggested but cant quite seem to get my head around it to see where I should be looking. Backing all homes wasn't so much an idea, as an observation. At the start of the season, there was no reason to look at backing Homes. The trend had been towards Away wins. It was curious how last season Homes were so prominent in different top leagues, but nonetheless, for now at least I suspect it was a temporary blip in the general increase in Aways over recent years than the start of a Home trend. We'll see. The idea of waiting for a few rounds (six seems to be the favoured number of matches for form) for form to settle down has merit for a model, as teams can change considerably from one season to another. It also allows the model to incorporate promoted teams which can be a challenge. The motivation factor at the end of a season can also be disruptive, but it can also be lucrative. Just look at the record of teams managed by Tony Pulis once they have reached the 'magic' 40 point total - 6 wins in 46 such games. Last season, West Bromwich Albion reached that total by the end of February, yet picked up just five more points all season, and just one point from their final eight games of the season. While omitting the first few rounds from the results makes no sense when looking at a trend, what might be interesting is whether the first few rounds are enough to signal the possible start of a trend. Looking at the first six rounds of the EPL last season, Home wins were in profit after 60 games, with an ROI of 4.3%, but the leader early on was Lay the Draw with an ROI of 9.3%. 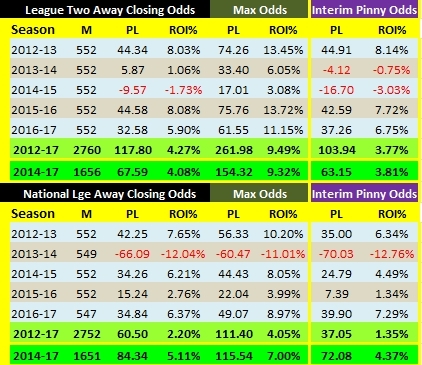 At the end of the season, Home wins were up another 27.58 points, while Laying the Draw had added another 6.32 points. 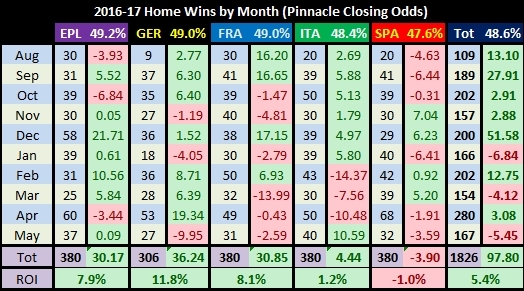 The gains for Homes in the EPL were all in the mid-season winter months, November to March +38.77 points, rest of the season -8.60. 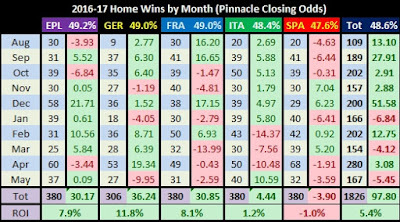 I think it's a coincidence, but in this case, eliminating early and late matches would have improved returns from backing Homes. The trouble is, in the EPL we had no strong signal for Homes until 14 rounds were in the books on December 5th, and the ROI was at 3%. 36 of 58 (62%) of December's fixtures resulted in Home wins, and a 21.71 point profit in this month. Close behind the EPL's Home Win percentage of 49.2% was the Bundesliga with 49.0%, and as the table below shows, here the trend was evident from the start. 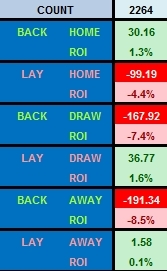 December was, by some distance, the best month for backing Homes, profitable in every league. One season's results mean little though, but it'll be interesting to see what trends unfold for the 2017-18 season. It has been brought to my attention by Steve Mullington that I am running a mile at Sandown Park in a little over two hours. There's a newcomer called Cassini running in the 6.45pm race at Sandown today (10th Aug). It must be worth a little flutter. Of the eleven runners listed, four have already taken one look at me and decided not to bother, so the field is already down to seven. Expect more drop outs as I go through my warm-up routine. Cassini (IRE) : Foaled January 12. Galileo colt. Closely related to useful winner up to 1¼m Cunco. Dam winner up to 1¼m (2-y-o 7f/1m winner). Wears tongue strap and he's an interesting newcomer. In a race that lacks confirmed pace-forcers, Dubhe could get the run of things. Of the better-fancied horses, Cassini is most likely to be ridden furthest from the pace. I'm looking forward to it, although not too sure about this 'tongue-strap' thing. Update: Didn't enjoy that at all. Stupid name for an evening race - Slug And Lettuce Value Lunch EBF Maiden Stakes, and only won £577.20 for coming third. Me and my short head are off to bed. I have mentioned Australia's sports-betting investment fund Priomha Capital before, as far back as January 2014, so they must be doing something right based on longevity, (they were formed back in 2010 I believe), and courtesy of Investment Europe, found this article regarding their thoughts on the EPL next season. Reporter Adrien Paredes-Vanheule seems unaware that Barclays sponsorship ended in 2016, but I can overlook that as the thoughts of others are always interesting. Although no Champion has repeated since 2008-09, I concur that at 5.0 Chelsea look value, even if favourites Manchester City are starting the campaign off with the easiest Premier League fixture in world history. I've posted the current odds (above) because they are slightly changed from those in the article. The football season is back in the UK and other countries across Europe. This Sunday has seen Arsenal taking over last season’s Barclays Premier League champion Chelsea during the traditional pre-season Community Shield game. It is another former champion, Leicester – 2015/2016’s BPL winner – the Gunners will face for the opening of the season on Friday 11 August. Winners, relegation, first games of the season, InvestmentEurope has collected the views of Brendan Poots, CEO of Melbourne-based sports hedge fund Priomha Capital, who runs strategies that invests in various sports events including football. Poots first notes the usual suspects top the markets for the 2017/18 Barclays Premier League with Manchester City favourite in the betting world at $2.90, followed by Chelsea ($4.70), Manchester United ($4.90). Behind the trio remain three other contenders : Tottenham ($11.00), Arsenal ($13.00) & Liverpool ($16.00). “Our ratings have Manchester City and Chelsea sharing favouritism at around $3.50. Given the current markets City are not value but we do not want to oppose them… our only BACK (long position) pre-season is Chelsea. “Manchester United, by our ratings are closer to a $7.00 chance, consequently we have taken a position against them pre-season. Tottenham, Arsenal & Liverpool all look fairly priced,” Poots explains. Priomha Capital’s CEO says that a solid season can be expected from West Ham, Everton and to a lesser extent Southampton as they should finish in the top 10 this season. “We expect West Brom to drop a few places from last season, and we expect Newcastle to be very competitive in their return to the Premier League,” he argues. The sport hedge fund’s ratings see Newcastle outperforming the two other promoted teams Huddersfield & Brighton and place the Magpies close to mid table at the end of the season. “We are heavily in Newcastle’s corner,” comments Poots. “Huddersfield are expected to go straight back down. We cannot disagree with that. Burnley are strongly favoured by the market to be joining them. We do not agree with the market’s opinion. Burnley was very solid at home last season and there is nothing in the key indicators to expect this to change. “Their home form alone will be enough to keep them up. Our ratings expect improved away performances and this should be more than enough to keep them safe. We will be backing them to stay up. Newcastle will have no issues staying up, now that they are back. This leaves Brighton, Watford, Crystal Palace and Swansea to be fighting to stay up,” Poots argues. Priomha Capital’s CEO pinpoints that apart a couple of pre-season positions taken in the Priomha Cloney Multi-Sport strategy, the hedge fund will look to trade the opening six rounds as their own separate competition. “Manchester City have a relatively easy opening to the season. Their potentially tricky matches (including Liverpool) are all at home. They are very likely to have at least 16 points after the opening six rounds. If this is the case then they will be trading close to $2.00. “Last year, after a solid opening they were trading sub $1.60 (I pity those that took that price). We will take a small piece of the current $2.90 on offer with a view to trading this during the opening stage of the season,” says Poots. He pursues: “In the first six weeks, Chelsea has Tottenham (away) and Arsenal (home) as their toughest tests. We have them dropping points at Spurs but beating Arsenal. They will be on at least 15 points after the first six rounds. Their price will probably firm during this period but given that we already have exposure to them we will not be actively trading. Poots suggests that Arsenal, Tottenham and Liverpool will have harder starts to the season and anticipates they will be all in the 12-15 point range. “Should this be the case their prices will not drastically move. We will not trade any of these sides during the first six weeks,” Priomha Capital’s CEO says. Newcastle United's prices are a little unusual. Based on the winner market, they are rated 10th / 11th (along with Southampton), behind the usual suspects above, plus Everton, Leicester City and West Ham United, but in the relegation and top half markets, they are rated 15th, ahead of only Swansea City, Watford, Brighton and Hove Albion, Burnley and Huddersfield Town. Lay Newcastle United to win the league - Nap. The mention of Chelsea and their visit to Tottenham Hotspur is also interesting. This will be the latter's first home league game at Wembley Stadium, and as has been well documented over the years, teams take a while to adjust to new grounds. Game 7 for Chelsea is v Manchester City while Game 8 appears to be their toughest game of the season. Trivia Time: What other club has played home league games at Wembley Stadium? I sincerely hope you won't be hanging up your boots any time soon, as I've only just stumbled upon your blog. Terrific stuff. I've even managed to squeeze some money out of the T-Bone run-lines since then. My only sorrow is that the amount of interesting writing on this blog probably exceeds my brain's ability to absorb information. Greetings from Norway, and have a pleasant week. I actually write this blog with my fingers rather than feet, but I have no intention of hanging up boots, gloves, coats, hats or anything else, at least not any time soon. At least not permanently. I do have a business trip coming up next week, followed almost immediately with a trip to see my second 'once-in-a-lifetime' total eclipse on August 21st, so my fingers will be rested for about two weeks. I also made it to the total eclipse of August 1999 in Cornwall which was a great experience, and this one should be even better as Falmouth was unfortunately a little cloudy. The comment is much appreciated, and it's good to hear that some people take on board some of the ideas I share. How much easier it is to post a baseball update when you hear that someone else has been able to make some money from suggestions published here. Since Dr. Sportello mentions the T-Bone System, we'll start there. 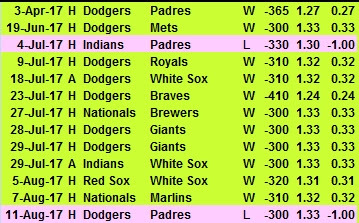 Last night's qualifier was the Chicago Cubs, and while not included in the numbers above, they were a winner on both lines after beating the San Francisco Giants 5:3. 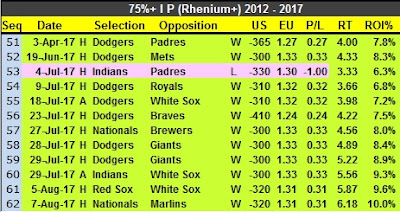 The Rhenium System (75% or greater Implied Probability) is currently up 2.45 points from 12 selections, on track to beat last season's 2.58 points from 21 selections. Only the Mountain High System is letting the side down, yet again, with its worst performance since time began - well, 2010. A good day for the ego of this blog's owner, with two very much appreciated compliments coming within a few hours of each other. This blog, currently around seven months shy of a decade, has certainly outlasted many of its contemporaries. At the outset, I wouldn't have bet too much on it lasting a decade, unless the price was value of course, but even the current 1.01 is starting to look value, a debilitating stroke, heart attack or serious accident notwithstanding. I am a little confused by the Bolton reference above. Perhaps conflating Brighton and Hove Albion and Bolton Wanderers is excusable when you're Portuguese. I confuse Aves and Chaves in the Portuguese League, which admittedly is nothing to Braga about and not very Sporting, but in my defence I'd had a glass or two of Porto. With a sick bucket handy, I risked another visited to Miguel's homepage, and was relieved to see that the nightmare image of Tony Bloom and others celebrating promotion, has been replaced with that of former Bolton Wanderers and Super Eagle star Jay-Jay (so good, they named him twice) Okocha. Long may he reign on Adonis's homepage. Unfortunately not everyone is happy with the blog. While there has been plenty written about underdogs over the years, I have to admit that the dogs Tony is interested in are of no interest to me at all. Perhaps I'm missing a trick, but I really don't see illiquid Greyhound markets as likely to offer any value to an outsider. Covering a number of sports does help to add variety to this blog, and it is said that variety is the spice of life, but don't expect dogs to be added to the list. As the 2017-18 season gets underway, I thought I'd take a look at last season relative to the previous 10 seasons. It was unusual in many ways. First the relative decline in goals per game in the Bundesliga, which from 2006-16 led the "Big Five" - the others being the EPL, Serie A, Ligue 1, and La Liga - every season in this category, averaging 2.88 goals per game. Last season saw the Bundesliga drop to third, behind Serie A and La Liga, but this relative drop was due to an increase in goals in Italy and Spain rather than a decline in German output where goals remained very much in line with their average. Home goals per game in these three leagues were all at 1.66, but the Away goals in Serie A jumped by 17.3% from a ten year average of 1.10 to 1.30, while in La Liga, they increased by 12.8%, from 1.13 to 1.28. More goals means fewer draws, so it's no surprise that the Draws in Italy dropped from an average of 27.2% to just 21%, while the increase in Away goals pushed Away wins up from an average of 26.5% to 30.5%. No edge on backing Aways blindly though, as this strategy would have lost 39.36 points on the season although all the losses were on the longer-shots (IP < 0.3). +13.99 points sub 0.3. Over the ten seasons 2006-16, the average Home win percentage in all five leagues was 46.2%. This trend towards Home wins was also seen in England's Championship which went from an average of 43.4% Home wins (2006-16) to 47.5% last season, while Draws dropped from 28% to 23.6%. Whether any of these changes will become trends or merely blips remains to be seen, but it's interesting watching how leagues evolve over time. A recent commenter on this blog is young Miguel Rodrigues, who has the modest Twitter name of @adonis9898, and which as I have mentioned before, is an account worth following, even if his banner picture turns my stomach and makes me throw up a little bit in my mouth each time I see it. With an emphasis on the Portuguese League, Miguel has been betting professionally on football for three years. Statty, aka @Statsbet, recently posted a Q and A with Miguel, and there are some good observations and advice therein. I mentioned the over-round earlier today, and for the last three EPL seasons, not one match, using Pinnacle's Closing Prices, has had an over-round of 103% or higher. The worst 11 matches were all between September and December of 2013, and last season's average was 102%, with a worst of 102.99% (Southampton v Manchester United - an end of season Wednesday night re-arranged fixture) and a best of 101.7% (Manchester City v Swansea City). These numbers are of course, historically low. Going back to the 2000-01 season, the average over-round for the season with William Hill was 112.53%, with Ladbrokes 111.07% (from the 325 matches with prices available) and if you were able to back at the best odds across the board, you were still up against an average over-round of 107.55%. Good luck to anyone trying to beat those prices consistently. Roll the clock forward to today, and the 'over'-round at the maximum prices last season was as low as 88.2% (another end of season game, Hull City's 1:7 thrashing at home to Tottenham Hotspur). In only 20 of the 380 games last season was a sub 100% over-round not possible. Hard to lose money when you look at it like this. Pinnacle's model has at least had some effect on the traditional bookmakers, although they are still generally poor value, not to mention their short-sighted policies of limiting and closing accounts. Ladbrokes last season still had an average over-round of 104.9%, while William Hill was at 104.7%, Bet365 was at 102.9%, with BetVictor a creditable 102.8% if you can keep an account open with them. I also took a final pre-season look at the League Two and National Leagues making a few updates to ensure I was being consistent. One of the challenges with the much appreciated data at Football-Data.co.uk is that for various reasons, it's not always complete. For example, last season's National League had five matches missing Pinnacle prices completely. I took the decision to ignore these matches, but where Pinnacle Interim Prices OR Closing prices were available, I assumed no price movement and used the available prices to fill in the blanks. Not ideal, but here are the last five seasons Away results from League Two and the National Leagues. Hello, not sure I've quite understood the data. How can blindly backing home and laying home both lose? 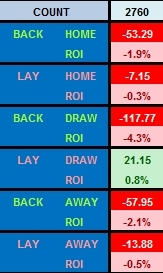 Or how could backing home, away, and draw all lose quite so much, when you would expect to be only slightly down if you backed all the options? Is it that the bookmaker's margin is between 1-2%? How much is the bookmaker's margin on football matches, and does the data imply that the odds are broadly right (less the bookies spread)? This may be ignorance on my part as most of my activity is on Betfair, where markets add up to 100.2%ish and Betfair takes its (healthy!) cut at the end. The average over-round for sports-books varies a lot, and from league to league, but the arrival of Pinnacle has helped. As Eggmund surmises, the over-round is the reason why, in the long run, most 'blind' strategies will slowly bleed money. Over five seasons and 2,760 bets, that number will add up. Note that I adjust prices for the over-round when calculating the lay returns to give a realistic picture. What is not a realistic is the claim from the Secret Betting Club that backing all 2,416 home teams "in the top 4 English Leagues and the SPL last time out" would have returned a profit of 81.7 points at 3.4% ROI**. I have to point out that it's no secret that the total number of matches in the top four English Leagues plus the top Scottish League last season was actually 2,264, (380 + 552 + 552 + 552 + 228) and using the more realistic and achievable Pinnacle prices, backing all Homes had an ROI of only 1.3%. Homes were still in the green by 30.16 points, but not close to the 3.4% claimed as an ROI. I'm not sure I understand the logic of lumping different levels of football together in this way. It may be a 'secret' strategy but each league has its own personality, and League Two or the Scottish Premier League have little in common with the English Premier League. As Home backing in those two leagues (Two and Scottish Premier) would have lost you close to 60 points, I'm not sure why they were included at all. It's important to understand where the profits and losses are coming from. The NL picture looks very different if you factor 2013/14 results into the mix Cassini! How far back you want to go looking for trends is up to the individual. Personally, I think two or three seasons is good, but in the case of the National League, the last quarter of the 2013-14 season did also show a profit on Away teams, a signal easily missed when looking at the season as a whole. ** The Secret Betting Club's numbers were "based on the results as taken from the football-data.co.uk website, which tracks the best early odds from a panel of 3 bookmakers". In contrast to Leagues Two and National, blindly backing of Away teams shows no sign of profiting from a market weakness. 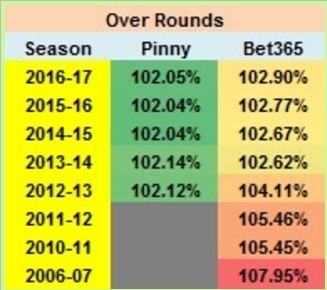 The only 'blind' strategy that would have been profitable from 2012-17 was Laying the Draw, but an ROI of 0.8% isn't anything to get excited about. Aways were profitable from 2012-16, but 2016-17 saw the fewest Away wins (27%) since the 2009-10 season, and as a result lost over 90 points. Away wins lower down the English pyramid were the result in 33% of matches. Aways did become profitable if you ditch the longer-shots, those with an Implied Probability of less than 0.25, and this strategy would have had an ROI of 2.5%. League One is the division in England that I have the least interest in. Whatever division the team you support is playing in comes first, fortunately for me that is currently the Premier League while who might be coming up from the Championship means I take an interest there. At the other end, who is dropping out of the league is of interest, while which non-league sides are entering (or re-entering) the Football League is also interesting and means I look at results there also. League One gets lost in the middle, in a kind of no-man's land, and with no real trends, I think I'll keep it that way. Other than checking in every once in a while to see if Portsmouth, playing at a level they are certainly are not accustomed to, can survive. Skeeve example is the perfect example for the ones with a exclusively mathematical based approach who look at subjective analysis as a primitive source of an edge. Football teams are "stock prices" and although the odds efficiency in the main leagues is so strong that is difficult for the experienced bettor to see if the price is currently 5% off with subjective analysis, that is very doable in lower level leagues and I can not emphasise the example of Skeeve too much. In betting there will always exist spots for the guy who is willing to outwork and out-learn the competition, at least in the next 5 years. The problem with subjective analysis is it's usually a low volume approach and difficult to use great staking methods like Kelly, but should not be viewed as a primitive source of an edge. I would love to know your take on this opinion and if you find any particular flaw in my assumptions, please let me know. I appreciate the comment. As I've written before, posting blog entries is so much easier when there's a comment to start the ball rolling. Unfortunately I have little to disagree with Miguel about regarding his thoughts. One thing I would say is that regarding the line "football teams are 'stock prices'", I think Miguel means that publicly traded companies are like football clubs (some clubs are indeed publicly traded companies) while stock prices are like betting prices in that they are the opinion of the market based on all "relevant" information. Relevant here is a combination of past public information, breaking new public information, and private (insider) information. Knowing along with everyone else that City beat United 2:0 three years ago isn't a lot of use to you. Knowing that a star player for Barrow (assuming they have one) slipped in the shower this morning, suffered a concussion and will miss tomorrow's game is useful. Installing hidden cameras in the bathrooms of non-league stars is not practical, or legal, but plenty of people have contacts who can provide information before it becomes public.